I have to admit that I owned some early Nickelback too. Not the poster though. Chad had not yet morphed into the douchebag he is today. Early Nickelback I can understand. They were up and comers, not yet the only thing that Dave FM plays! 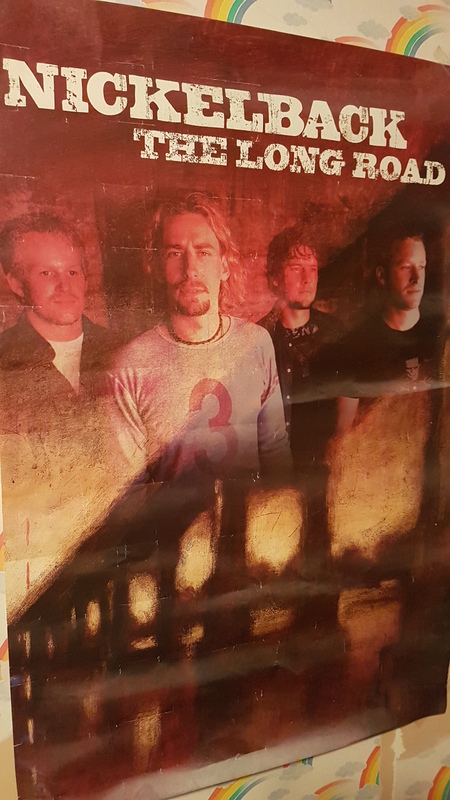 Never got into nickleback, but did quite like the songs ‘burn it to the ground’ and ‘leader of men’ if they’d come on music tv channels between bands I did like. My mum bought the album Silver Side Up though, that was pretty rubbish. Burn it to the Ground is probably the song of theirs that I hate the least. I think I had an early album, but no more. There is exactly one Nickleback song among my dad’s whole collection and none among my significantly smaller one. It’s on a compilation as well. Good stuff. One song is a forgivable offence. But did she have a Theory of a Nickelcreed poster?! No but in my younger days I would have attempted making one! 16. “Saturday Night’s Alright for Fighting” (( Elton John cover) Ft. Kid Rock and Dimebag Darrell)???? Is this true? I would say the defense is trying to keep those records sealed. 16 is the theme song for Hockey Night in Canada but you knew that! And yeah that’s sadly true. I am pure and unsullied. I read a quote from.Chad that mentioned him and the lads were making Lego structures at a fans house in Wales. Oh you mean 1637. We don’t get on. was about. Know it all makes sense. Unsullied like on Game of Thrones? I’m so sorry for you! I still have a track. One track is same as me, so you are OK! Nickelback will never trouble the ears of those setting foot in my home. This is a safe zone. Good to know. I don’t hate ’em like I used to, but I also don’t hear very much good in them. Oh man I own Nickelback… they’re on a bunch of the Big Shiny Tunes collections, and one Harley Davidson road rawk-type compilations I have. No albums though, so I feel like they snuck into my house but there wasn’t much I could do about it. See I think that is totally forgiveable. Like if you were in court charged with Wanton Nickelback, I’d let you off with a warning. No jail no probation. I think it would help my defense by telling the truth: I skip those songs when I play those comps.